We woke up in the Lompoc city park, took care of our usual morning routine of coffee and breakfast. As Tim made the coffee, I wandered over to the camp host’s site and asked if we could charge our electronics in the vacant RV site next to the hiker/biker. He said, no problem. So we plugged in all of the devices and continued breakfast and taking down our camp. While we were packing up, the park ranger drove into the campground to collect the fee envelopes from the self pay box. To our surprise, he came over to the hiker/biker and gave Henry and Danielle a refund. They had been used to paying per person in CA State Parks. Naturally, they paid $10 for their site, $5 per person. But at the Lompoc city park, the camping fee was $5 per site, not per person! And he graciously explained they paid too much and gave them $5 back. Needless to say, we were all pleasantly surprised by the sane rates at Lompoc city park and at the Park Ranger’s efforts to make sure Henry and Danielle didn’t overpay. After witnessing this interaction, Tim struck up a conversation with the ranger, told him we appreciated his nice clean park and the sane hiker biker rates. He completely understood and went on to praise bike tourists: You guys are easy. You’re quiet, you don’t make a mess, and you don’t fill up our dumpsters with garbage. Thank you City of Lompoc park ranger, at least someone appreciates the value of our low impact mode of travel! After talking with the ranger, we finished our breakfast, checked our email and slowly (more slowly than usual) worked through the rest of our morning routine. Just as we were rolling out, Tim checked his mail and got a surprise from Robert, the friendly Trader Joe’s-Selle Atomica-saddle-guy from yesterday. To back up a bit … Robert had contacted Tim the previous evening and said he might be able to meet us and hand off the loaner saddle, but due to phone/data reception issues (T-mobile: the worst possible carrier for bike tourists) Tim didn’t think he’d be able to firm up a time and place to meet up. Before turning in he sent Robert a mail basically thanking him for his effort but telling him to not waste his time on our flaky schedule. A dead phone battery precluded any more communication but we went to sleep with a warm buzz fueled by the kindness of strangers. Back to us rolling out … Tim checked his mail and there was Robert again. As a rider himself he knew the route we’d take to the coast, and to our good fortune, he was going to be in the area TODAY. He said he’d bring the saddle with him and hopefully see us on the road (as you can imagine, we’re hard to miss). Of course, had Tim actually seen that message in the morning we would have been a bit more motivated to get out of camp and on the road. Instead we had been moving so slowly, enjoying the hospitality and charging of Lompoc, that we were sure there was no way we’d be anywhere near where Robert would expect to find us. But still, we were once again floored by his kindness. By then, the temperature had risen beyond a comfortable level for us wimpy Seattleites. We knew today would be another miserably hot one. Another reason we should have started a bit earlier. To top it off, we started the day with another huge climb. Will we ever learn? We hit the road and plodded along at a steady pace, heat radiating off the pavement and no shade in site. The start of the climb was gradual but long. Thirty minutes in and it didn’t yet look like a climb though it sure felt like one. Already suffering, we began to worry what the actual climb would bring. As we were running through our inventory of water a car pulling up behind us jerked us out of our pain. I’d been skeptical that the saddle delivery was going to work out. Was this stranger really going to go out of his way to help Tim and his sore knees? Yes! We glowed a little bit more the rest of the day, both from the heat and from our appreciation of the kindness of a complete stranger! After chatting with Robert for a few minutes, we were on our way again. We finally reached the summit of the climb. And on the other side of the road were a few trees and a patch of shade. We made it! Deep down I knew we would, even though the heat caused me to have some doubts. We crossed the highway and huddled in the shade for a long time resting, eating a few snacks and drinking lots of water. After the climb, the route took us to the ocean with promises of lower temps and ocean breezes. Even though the route joined busy 101, but we didn’t care about the highway traffic. Oceanside riding meant the temps dropped to a mere 90F! We passed Refugio State Beach, where Danielle and Henry planned to camp and continued to El Capitan State Beach. A bike tourist we’d met in Big Sur told me he camped at El Capitan and it was nice. He also said there was a private campground on the other side of the highway with a store. The store was our carrot for the rest of the afternoon. Ice cream! Cold drinks for the kids! Beer for the parents! Maybe chilled wine for dinner! When we arrived at the store, we learned the private campground was a really fancy glamping resort, with rates between $150 a night on up to $795 a night for their cabins. We didn’t let the fancy faux-camping clean people deter us from our drinks and ice cream. We dragged our stinky, sweaty, fresh off the Hwy bodies into that store and gladly paid $40 for ice cream and beer! We arrived at El Capitan, had our usual conversation with the rangers about hiker/ biker rates and per person vs. per bike argument. They didn’t care. In fact they were really rude. We reluctantly paid and made our way over to the hiker biker area, trying shake the bad experience with the rude rangers. The hiker/biker site was tucked away in an area of the park that was secluded from the mayhem of the crowded campground. It had a beautiful ocean view with a private beach access and it had brand new, nicely tiled, clean showers! After we set up camp, we went down to the beach to splash around in the water and eat dinner on the beach. We even saw a school of porpoises playing in the water! High: Leaving the heat and arriving at the ocean! This entry was posted in bikes, Pacific Coast Bike Tour and tagged 2013, acapaccoast, bike touring, bikes, CA, carfreedays, El Capitan State Beach, family bike touring, Family Cycling, kids, Lompoc, Pacific Coast Bike Tour, tandem, tandem bike tour, two tandem bike tour. Bookmark the permalink. that’s really sad that they charged you per person instead of per bicycle. I would have gladly paid a $100.00 for cold beer after that ride in the heat! Hi Marge — Thanks for the comment! Tim plans to post about camping experiences on the trip. CA State Parks has some weird solutions to their *issues* with homeless people camping in the parks. The per person rates are one solution to battle the “homeless problem”. As a result, they alienate travelers who need a place to camp too! The glamping place was surreal. I’ve never seen that many people in white pants at a campground! We gladly paid their overpriced rates for our cold food and drink! 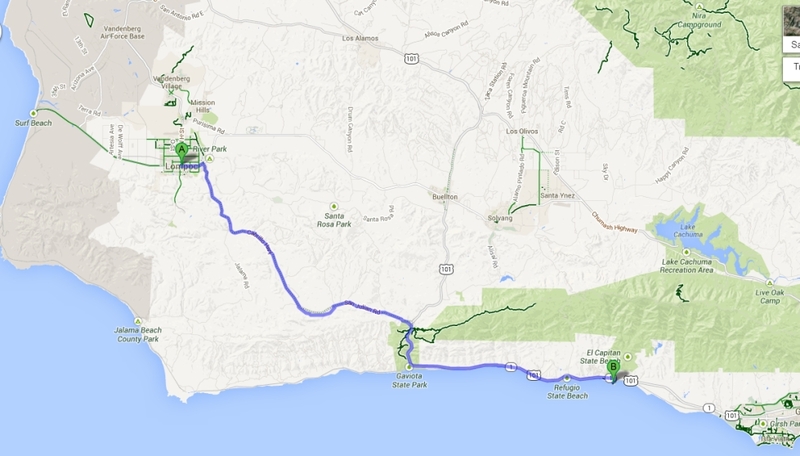 The ride from Lompoc to Santa Barbara was long and lacked any place to get food or drink. We ended up eating lunch at the first place we could find which happened to be a golf course. Good luck on the rest of your ride. Here is my wife’s blog on our trip. Hi Al — Just checked out your blog. Congratulations on your trip! Looked like a good one. How old are your kids? The kids are 9, 15, and 16. Sad that the trip is done and we’re back in the real world. Keep you chin up. The road will get better as you go south. My experience at El Capitan was much different. The place was filled with vagrants. I show up at the hiker biker site and some clown claimed hat he had rented the entire site, and “graciously” allowed me to share it. He had his underwear drying on the table. Yuck. Yes, the proximity to the store across the highway was nice, but it’s still only 2 miles from Refugio, which is much nicer. Refugio has a great site adjacent to the beach, with the RV people further inland. It’s worth the 2 mile ride for supplies to stay at Refugio.